Scheme discussion: Could Patriots use SB53 game plan against 49ers in the near future? The 4 man line with two outside LBs to take away the edge runs were quite innovative. Belichick schemed to stop the outside zone run and succeeded......but could he give McKinnon and Breida similar issues? I'm not totally sure he can. Our 21 personnel usage with Juice I think would offset what was done to the Rams. We don't run WR routes quite the same way as the Rams. This article basically alludes that the Rams (like the Chiefs) use too much gadgetry to get guys open. I really think Shanahan has a more sophisticated offense than these other two that requires more time to gel and doesn't rely on too many cheap tricks. I think the Niners will be a lot closer to that Falcons team this year, if we can land at least 1 star receiver in free agency. The 49ers and Rams offense differ in one very drastic way - the Rams use 11 personnel (1rb/1te/3wr) at the highest rate in the league (77%) whereas the 49ers vary their personnel grouping much more. It's hard to say anything is limiting of the Rams offense since they scored a bunch of points, but when given 2 weeks to prepare like in the SB, having variety in the offense makes it harder to gameplan for, and playing out of a certain personnel grouping so much is a limitation. 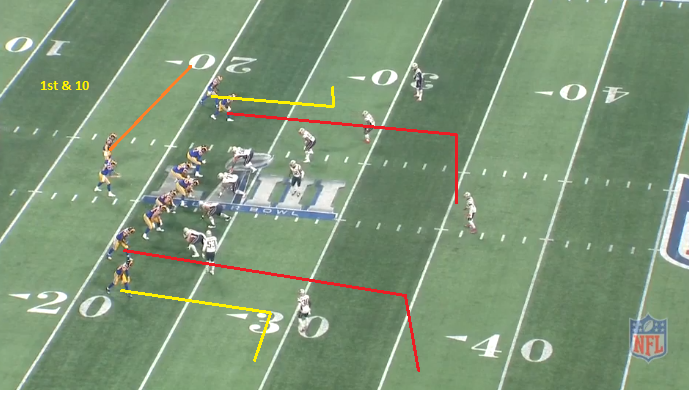 About the run game, the FB is essentially an extra gap that can be moved around - the 49ers use one and the Rams don't. The FB can line up on one side of the formation (or in an I formation) and at the snap move to the other side of the formation to block. He's a factor in the run game that provides uncertainty in the defenders, and that's a good thing for the offense. If a defense is dead set on not allowing runs to the outside, the "extra gap" can be placed between the tackles. About Quarters coverage, it's a coverage that forces an offense to dink and dunk down the field even more so than Cover3 since Quarters can have up to 4 defenders deep. I watched a bunch of plays from the SB and I didn't notice a ton of Quarters but it was mixed in (maybe I remember wrong). NE threw their entire defensive playbook at Goff in terms of coverage and I don't think they ever called the same coverage two times in a row the entire game. Not only did they mix up coverages but they also disguised presnap. Goff is simply too inexperienced to carry an offense with his arm. There were WRs open on some of the plays where he looked like a deer in the headlights but he couldn't find them. To beat Quarters it requires patience and willing to attack the flats. I'll show one play where Goff did not do this, and I'm assuming it happened multiple times in the game. After watching the super bowl I am convinced that Kyle is MUCH better at scheming players open. I know your original question was more about the 49ers and how they would do against the NE defense, but this is one play that jives with the SI article that was posted in the OP about Quarters. In this pic, the ball was just snapped. NE shows a single high safety MOFC. This is 4Q game tied at 3-3. Post snap they rotate to Quarters (MOFO). Goff chooses to work the weakside, which is fine. But he is so hesitant. 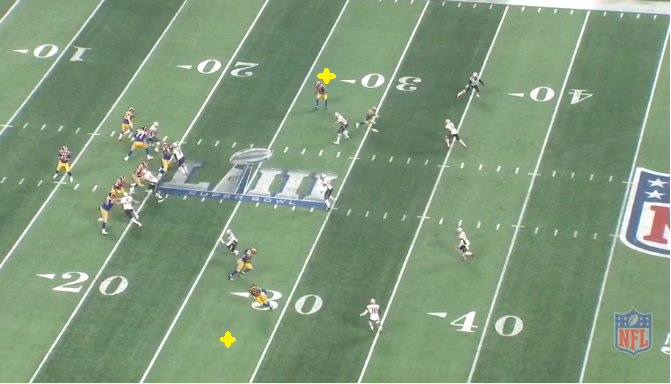 If he puts the ball at the yellow cross it's a short completion to the flat, which is where Quarters coverage is weak. Take what's given. Instead, Goff hesitates and throws late to the flat on the other side, but by then the strongside C/F defender has buzzed to the flat and shuts it down. So according to the Ram that was interviewed in that article, NE does not play Quarters often. But it's not like Goff has never seen this coverage. It's not some unorthodox coverage. Yet the way Goff went through his reads here it seemed as though he had no idea what he was looking at. This ball has to come out as soon as he hits his back foot. BB and Brady will be retired before we even get to a Superbowl again, so we wouldn't have to worry about it. Thanks for the info, THL!!! Don't forget BB had no answer for Kyle in SB 51 for the first 3 quarters. They'll be dead before the 2020 season? I didn't say dead lol, I said retired.... other poster said dead.. The Patriots realized that Goff was being fed the information about the defensive formations before each play by McVay. The Pats then huddled up until 15 seconds left on the play clock when the headsets shut off. Goff had no cheat sheet then, and floundered. Obviously Garoppolo isn't any more experienced than Goff, but I dont see him being super dependent on his coach like Goff. Wasn't this widely known about McVay coaching Goff in this manner (like McVay's first season coaching)? Not sure it was something learned recently in prep or even in game. Funny thing is I wonder if it was smart of McVay to even acknowledge that he does that with Goff......there's no way you could tell that otherwise, unless you assume Goff is standing there staring at the defense for some reason. Given Belichick's penchant to study his opponent HCs, I'd say it was fairly easy to know what McVay was doing. Seemed an easy read for Goff on that play per thl408 breakdown. Makes me wonder if Goff went a bit off script initially looking down the hashes, trying to hit the top Red route. Thus putting him behind schedule on the quick read and throw required. If he had gone to the flat initially, and the outside WR can block his man, that would be most likely a 1st down gain or more. I think Mullens seemed to be ahead of Goff in overall recognition, and they have about the same amount of time in the offense. Super Bowl NE is done.